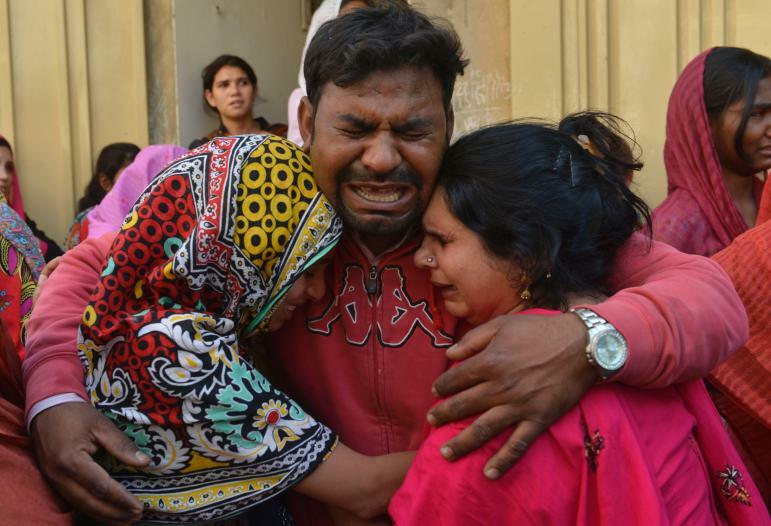 Pakistani Christians mourn the death of a victim of Sunday's suicide bombing, in Lahore on Monday, March 28, 2016. (London’s Daily Telegraph) – At least 72 people have been killed and hundreds wounded after a bomb ripped through a children’s play area in Pakistan where Christian families were celebrating Easter. Medical workers said the blast mainly killed women and children, while many of the wounded were in a critical condition on Sunday. The suspected suicide bombing took place on Sunday evening at a public park in the city of Lahore, just yards away from a set of swings. Medical workers said the blast mainly killed women and children, while many of the wounded were in a critical condition. The splinter group Jamaatul Ahrar, a faction of the Pakistani Taliban, claimed responsibility for the attack and said it had deliberately targeted Christians on Easter Sunday. “We claim responsibility for the attack on Christians as they were celebrating Easter,” a spokesperson for the terrorist group said. “It was part of our annual martyrdom attacks we have started this year,” he said and warned that more attacks would follow. The area was crowded with Christians celebrating the Easter holidays and many families were heading home when the blast struck, according to Haider Ashraf, a senior police official. “We are in a warlike situation,” he said, “there is always a general [terrorism] threat in Pakistan but no specific threat alert was received for this place.” He also said many of those killed were Muslims, who were also in the park at the time of the bombing. Footage from local TV stations showed chaotic scenes as people fled the area carrying their children or cradling the wounded. Al-Khidma, a Lahore rescue worker, told the Telegraph: “Our ambulances lifted dozens of injured people to nearby hospitals. The majority are women and children. Another medical worker said at least three hundred people had been injured and that he feared the death toll would rise. The Punjab government has since announced three days of national mourning and the closure of all public parks in Pakistan, vowing to bring those behind the attack to trial. Pakistan has been struggling to control a homegrown Islamist insurgency since 2004, with the Pakistani Taliban frequently carrying out attacks in an attempt to overthrow the government. The blast in Lahore comes just days after police in the capital of Islamabad clashed with thousands of Muslim supporters of an Islamist assassin, who was hanged earlier this year for killing a regional governor along with eight others in a bomb attack on his home. (London’s Daily Telegraph) – Highly skilled cyber specialists are being granted individual exemptions from normal military appearance rules (including allowing them to have long hair) in an attempt to attract experts who might otherwise be put off joining up, Britain’s Ministry of Defense has said. Commanders keen to recruit specialist expertise for 21st century warfare are also considering exemptions for reservist cultural advisers, linguists, intelligence analysts and criminal investigators. They have already revealed that the Army’s new cyber warriors will not need to pass military fitness tests and will not deploy abroad, or bear arms. But the special treatment has caused resentment among traditionalists and among some regular soldiers. One military source said soldiers at a base in the South West had last week been angered by the sight of two Royal Signals cyber reservists in uniform with shoulder length hair. One also sported “unkempt facial hair.” The reservists had been given letters by a colonel to explain their appearance to anyone who challenged them. Cyber warfare has emerged as one of the most important new threats in the defense world. China, Russia, Iran and North Korea are all believed to have developed formidable cyber warfare and espionage skills to attack computer networks. Military computer and communications systems are also a target for activists, terrorist groups and criminal gangs, who may be backed by foreign states. Yet militaries across the world have struggled to recruit experts who can keep up with the rapidly changing threat and there is strong competition for expertise from commercial firms. The waivers had to be individually created for specific posts and a decision was made on a case-by-case basis. The military insists the strategy is paying off, and high caliber reservist recruits were being attracted from the worlds of government, academia and the public sector. NOTE: CCTV (closed-circuit television) is a TV system in which signals are not publicly distributed but are monitored, primarily for surveillance and security purposes. CCTV relies on strategic placement of cameras, and observation of the camera’s input on monitors somewhere. (London’s Daily Telegraph) – One of the wealthiest towns on the Riviera with a crime rate close to zero has become France’s first municipality to install ‘talking’ CCTV cameras that tell off people for parking badly or dropping litter. The home of nobility and millionaires, Mandelieu-la-Napoule is best known for mimosa trees, sunbathers and A-list pool parties at secluded villas. Now the community of 22,000 people is under fire from civil liberties campaigners over the introduction of cameras equipped with loudspeakers. The system allows people spotted failing to pick up after their dogs or engaging in anti-social behavior to be reprimanded or ordered to stop by control center staff. For years, the French have resisted the widespread use of CCTV as an unwarranted intrusion into their privacy. Objections have diminished since the Paris attacks in November and three-quarters of medium-sized towns now have CCTV. However, many see the addition of speakers as a step too far. Two other French towns are introducing the system and 20 areas in Britain have ‘talking’ CCTV. Unlike their French counterparts, however, the British cameras also have microphones so the offenders can talk back to the control center, should they wish to explain themselves. b) What did the Islamist group responsible for the suicide bombing attack on Christians in a park say about their attack? c) Do you agree with those who say we must completely destroy all Islamist groups (ISIS, al Qaeda, Taliban, offshoots of the Taliban like Jamaatul Ahrar, Boko Haram, al Shabaab, et al)? Explain your answer. b) For what positions is the British military granting individual exemptions to certain military regulations? c) What types of exemptions will these individuals be granted? d) The need for cybersecurity is great. Where are the threats to Britain (and the U.S.) coming from? e) The Telegraph reports: “American commanders have also said their own cyber recruits will be spared some of the rigors or basic training.” Do you think our military has the same need to do this that the British military does? Explain your answer. b) How does the deputy mayor defend the use of “talking” CCTV cameras? c) The French have long been opposed to government’s use of CCTV cameras. After the Paris terrorist attacks, this opposition has somewhat subsided. Almost 75% of mid-sized towns now use these cameras. What reasons did residents in Mandelieu-la-Napoule give for opposing the “talking” cameras? d) Consider the reasons for and against cameras in this town with almost 0% crime. With whom do you agree? Why? e) The article on the CCTV cameras concludes: “British cameras also have microphones so the offenders can talk back to the control center, should they wish to explain themselves.” Would you support or oppose CCTV cameras being installed in your town that allowed you to talk back to a person in the control center? Explain your answer. f) Ask a parent the same questions for this news story. Discuss your answers. Describing the moment of the blast, one man who was visiting the park with his wife and two children said he heard a huge bang before all four of them were thrown to the floor. Another witness told the Telegraph he saw pools of blood and body parts scattered across the park after the smoke had cleared. “It was the weekend so there were a large number of families there, women and children were in the park,” he said. Former Lahore police captain Muhammad Usman told the Telegraph that police had recovered parts of the bomber from the scene and were seeking to identify him. “The blast in the Lahore was a suicide attack, it was just outside the exit gate of the Gulshan Iqbal Park and a few meters away from the children’s swings,” he said. Javed Ali, a 35-year-old who lives near the park, said: “Everything was shaking, there were cries and dust everywhere.